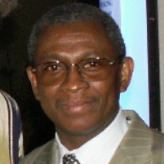 A career diplomat, Cyrille S. Oguin has served as ambassador to the United States from the West African nation of Benin since March 2001. He joined the diplomatic service in March 1978, and has held positions in the central administration of the Ministry of External Affairs and Cooperation, as well as in Benin’s embassies worldwide. From 1979 to 1984, Oguin served as second secretary of the Benin embassy in Accra, Ghana. During this time he led the mission as chargé d’affaires, ad interim, from July 1981 to September 1982, with accreditation also to Togo, Burkina Faso and Mali. He was appointed assistant to the chief of staff of the minister of external affairs and cooperation (1992-1995) and later as assistant to the minister of foreign affairs (1995-1996). From 1998 to 2001, Oguin served as director of human rights at the Ministry of Justice, Legislation and Human Rights. Since 2008, he has concurrently served as ambassador to Mexico and as permanent observer to the Organization of American States in Washington, DC. Oguin is fluent in French and English and can read and write Arabic. He is married and has two children.